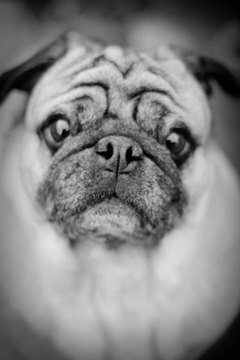 Puggles are great companion pets that bond quickly with their owners. A puggle is a mixed-breed dog achieved by breeding a pug with a beagle. These dogs are very sweet-tempered and playful, which makes them excellent family pets. Because they are intelligent dogs, puggles respond well to training, which makes the process of housebreaking fairly simple. Select a certain area of the yard to serve as your puggle's "potty area." By designating a specific potty area, you'll teach your dog to do his business in only this area, making cleanup much easier for you. Take your puggle outside first thing in the morning and every hour or two throughout the day. Most dogs need to go out within two hours after eating, so be sure to let your dog out after each meal. Lead your puggle to the designated potty area when you take him outside and wait for him to do his business. Praise your puppy enthusiastically when he does his business in the potty area. Offer your puggle a small food reward to help increase the chances that he will repeat the desired behavior. Purchase a crate for your puggle and confine him to the crate overnight and during long absences. Select a crate just large enough to accommodate your dog's bed -- he should be able to stand up and lie down, but there shouldn't be a great deal of extra space. Let your puggle outside as soon as you release him from the crate. Because dogs have a natural aversion to soiling their dens, keeping your dog in a crate will help to prevent accidents in the house. Supervise your puggle closely when you are at home to prevent accidents. Close doors and use baby gates to keep your dog confined to whatever room you are in, and watch your dog for signs that he has to go. Let your puggle outside as soon as he starts exhibiting signs that he has to go. Dogs will often sniff at the ground and walk in circles when they need to go. Consider utilizing a command phrase like "go pee" while housebreaking your puggle. Use the command phrase each time you lead your dog to the potty area, and he will eventually connect the phrase with the action. In time you will be able to use the phrase after letting your dog out, and he will automatically go to the potty area and do his business. Be consistent in praising and rewarding your puggle for good behavior. Try to develop a routine with your puggle, taking him out at certain times throughout the day. Dogs thrive on routine, and if you create a routine for your dog you will be able to predict when he will need to go out. Never punish your puggle for having an accident in the house during the training process. It will take time for your puppy to learn how to hold his urge to go, and punishing him could actually hamper the training process.